The Grand Central Terminal is one of the iconic landmarks of Manhattantown Midtown for a stroll through a historic site in the city. Or to stop to have lunch in one of the restaurants and fast foods that are under their brick vaults. 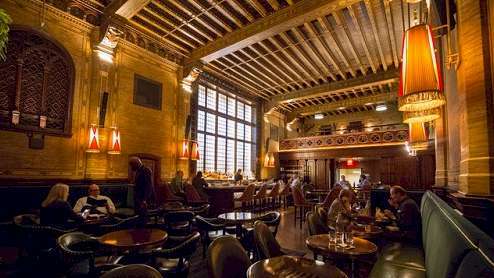 In the southwest corner of the station, on the Vanderbilt Avenue, there is an elegant bar, with charm and style. And remember the ’20s: The Campbell. Formerly known as the Campbell Apartment. The building is a legendary New York institution that belonged to John W. Campbell, a millionaire jazz amateur who financed the Big Bands of the first decades of the 20th century and turned his private office into a living room. cocktails in 1923. The Gerber Group, leader of the hotel industry that owns and operates many of the most famous bars and restaurants in the city, acquired the Campbell Apartment with the clear objective of restoring its original grandeur.